The Software Shows The Preview Of Data In Various Modes Like Hex View, MIME View, RTF, Normal, Attachments, HTML, Etc. Exchange EDB Viewer Tool Supports 2016, 2013, 2010, 2007, 2003, 2000 (32 & 64-bit) Versions Of MS Exchange. EDB File Viewer Is Compatible With Windows 2000, 2003, 2008, XP, Vista, Or Windows 7/8/8.1/10(32-bit Or 64-bit), 2008/2012 (32-bit & 64-bit) Versions. What is an EDB File Extension: EDB (Exchange Database) file is the store house of Exchange Server where it stores entire components (Emails, Tasks, Calendars, Attachments etc.) of the communication held within the organization. Exchange Server 2003 and its previous versions use separate files to save the EDB emails and attachments (EDB, STM). EDB file is of two types Priv1.edb (Stores the Private Communication), Pub1.edb (Stores the Public Communication) and STM (Streaming) file is used to store the attached data. Over a period of time, an EDB file may also get corrupted or inaccessible due to various issues like Dirty Shutdown, Jet Engine errors, etc. However, all the damaged EDB files are manageable and can be open with Free EDB Viewer Tool. With the Exchange EDB File Viewer software, you can now instantly access and open multiple email items, contact details listings, and everything associated with the user mailbox without spending longer duration to wait. This tool is also capable of opening and viewing the data of private and as well as public folders of Exchange EDB database. Also, users can view the attached data of STM file format. EDB Viewer Tool also supports to view & open corrupted EDB files. No issues when a single mailbox in your exchange EDB file is corrupted or the whole Exchange EDB file is corrupted. The EDB Database Viewer tool offers quick and advance modes of scanning to view corrupted Exchange EDB records (private as well as public file storage folder database). With the help of EDB File Viewer software, you will be able to view all the emails and all the attachments associated with them. This tool is enough capable to show the preview of the severely corrupted mailbox emails along with all the attachments like important documents, images, etc. With the Free Exchange EDB Viewer Tool, deleted EDB data items can also be traced in the same manner. All the Exchange corrupted files can be traced and previewed. 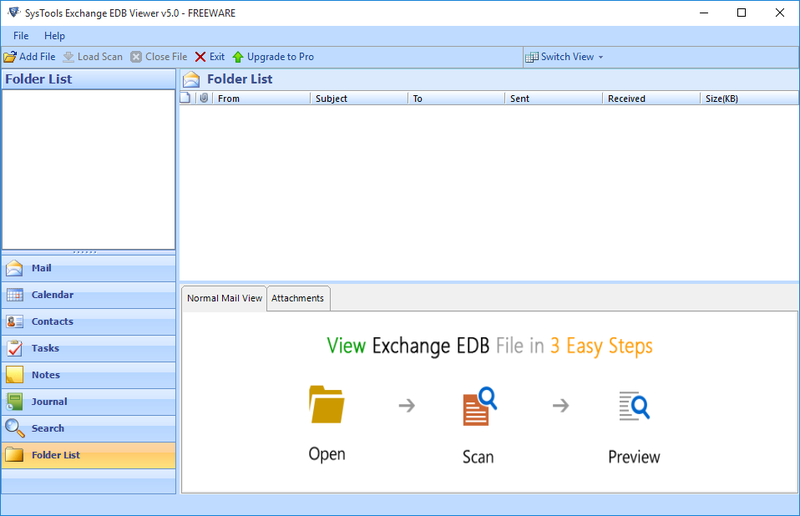 EDB Database Viewer allows a user to view and restore deleted items from Offline Exchange mailbox into multiple file formats. There is an Advance Search option available by the EDB File Viewer tool that allows users to search the items within EDB file. This feature can be used when you have to find particular mail from the large EDB file. This tool also helps in exporting searched resultant emails. Emails along with Attachments can be analyzed without affecting the EDB file structure. With its core features like Hex view, MIME, Header View etc. can be used for Forensic purpose. 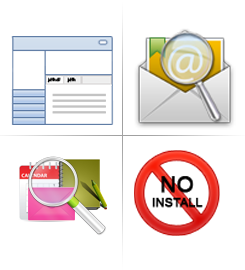 EDB File Viewer provides category wise preview of individual email and its key components like TO, FROM, SUBJECT, SENT, RECEIVED and SIZE without any external mail client. Advanced version of the tool can save the Emails in PDF file format. The software will create separate PDF file for each email. EDB Viewer Software provides multiple naming conventions such as Subject, Subject+Date, From+Subject+Date, Date+From+Subject, Date+Subject+From, Date+Subject, Autoincrement, with MDS. EDB Files (Exchange Database) is a Proprietary file storage format which is used in Exchange Server for data storage in general and emails in particular. Microsoft Exchange Server is a database-driven application and therefore, at the time of installation, it creates an EDB File named MailboxDatabase(GUID).edb that is stored in the default Exchange Server Mailbox Folder location. The software is easy to use and highly user-friendly. You need to provide the location of the EDB file in order to get started and the tool will show the data within the mailbox file. You can virtually install the software on any number of systems. Highly agile, fast and can load the large size EDB files in a few minutes so that one can instantly view everything within it. If any email has some kind of attachments with it, then you can easily view them with the help of EDB File Viewer tool which is enough capable to display almost every type of attachment to the user. Some of the attachments that the software will open up for you are Images, Documents, Excel sheets etc. The Free Version Of Exchange EDB Viewer Tool Can Only Shows The Preview Of Data Items Within The EDB File. Windows 10/8.1/8/7 or Vista users, launch the tool as "Run as Administrator". Explain the functioning of Exchange EDB Database Viewer Tool? 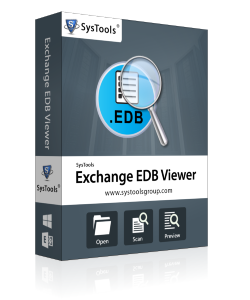 Step 1: Install & run Exchange EDB Viewer Tool. Step 2: Click on Add File to add the EDB file & select Quick or Advance Scan option if your file is corrupt. Step 3: The tool will open & shows the preview of all the data items within the EDB file. 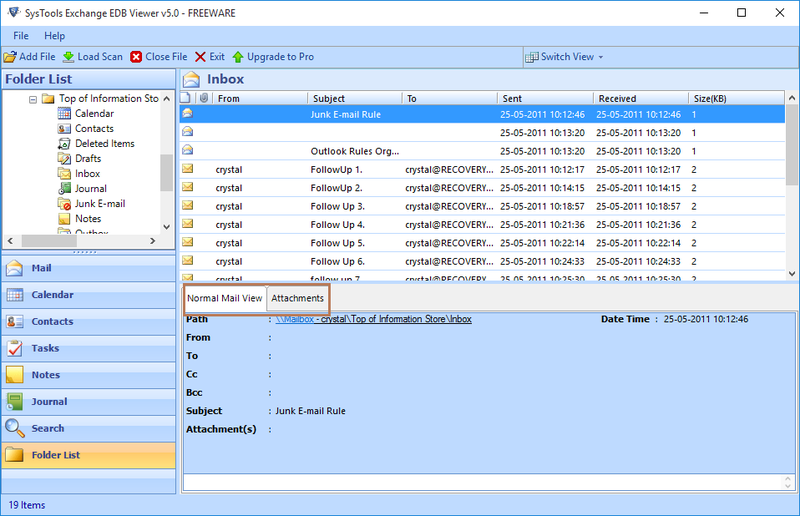 Step 4: There are various view modes for deep analysis of emails along with attachments. 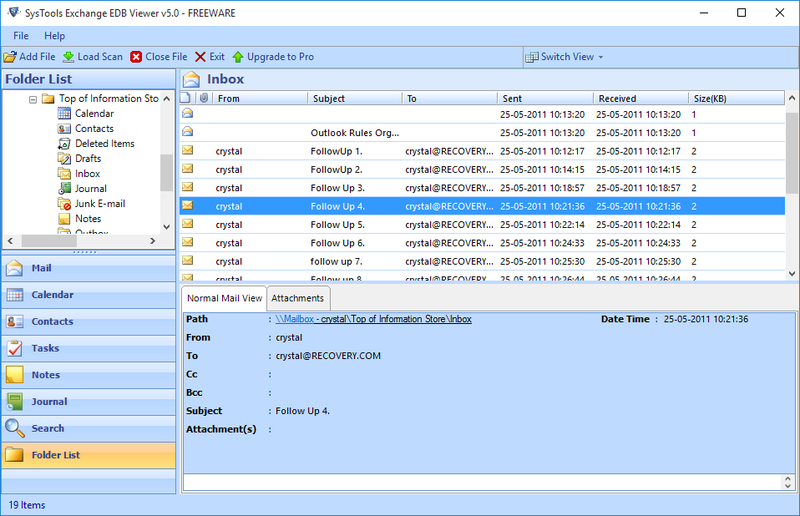 Step 5: View data in modes like Hex View, Normal Mail View, Attachments View, etc. Step 6: You can also switch view modes horizontally or vertically. Step 7: You can select emails to export them to PDF file format with the help of Pro Version of the software. I have some attachments along with emails, will it get converted into PDF? Yes, the Pro version of the EDB Viewer Tool can convert the associated attachments of the email. You can also download and save them separately on your machine. The mailbox is not connected to the Exchange Server then also is it possible that EDB Database Viewer Tool will work on that database? Absolutely Yes, you will be able to view the .edb files irrespective of the Exchange Server connectivity. What Operating System is the software compatible with? The EDB Viewer Tool works great on all Windows Operating system versions such as XP, Vista or Windows 7. If you face any technical issues, then please contact our support staff. "For me, as an Exchange Server Administrator, such tool becomes an indispensable part of our daily work and your tool came very handy on several occasions. Really glad that I have EDB Viewer tool with me. Even the EDB File Viewer runs on any Windows OS. " "A great asset for anyone working in the technology domain where we have to continuously manage different people, groups and take care of all their emails and mailboxes, EDB File Viewer Tool is of the first-aid kits whenever something goes wrong with the server. " "Thanks to FreeViewer team for developing EDB Database Viewer Tool that helps me a lot in viewing all the data items from the Exchange mailbox file. There are a number of view modes that allows me to view all the data items in different ways. It helps me in analysing the file deeply. I am really happy with the smooth functioning of the software." "I have tried many tools in terms of viewing all the contents of Exchange Database File. But FreeViewer EDB Viewer Tool is the amazing one. My file was corrupt but still, I was able to view all the data items from Exchange mailbox file. It takes a very less time to show the preview of data. Thanks for such an effective tool!"